That was the headline of a major article in the New York Times on November 25. In case you missed it while shopping on Black Friday, it was a scathing indictment of the State’s commitment to history. The byline for the article was Sackets Harbor, home to a New York State Historic Preservation Site. The article notes that Canada has &#8220earmarked,&#8221 (an interesting choice of word given the travails of New York State budgeting) $28,000,000 in support of battle re-enactments, commemorative events, new monuments, restoration, and an iPhone app. To add insult to injury, American states from Virginia to Michigan are lauded for planning for years to celebrate the Bicentennial with a variety of programs. Then there is New York. Nothing. Nothing. And nothing for three years in row and two governors. Better to offer tax incentives to entice businesses to locate in upstate New York than to promote cultural heritage tourism to sites that already exist. Even as the New York Cultural Heritage Tourism Network prepares to meet in Syracuse to promote exactly that in upstate New York, our government is conspicuous by its absence. The NYT article reports that the Sackets Harbor State Historic Site was still handing out brochures printed while Eliot Spitzer was governor. Readers of this blog know that during the Mohawk Valley Teacherhostel/Historyhostel in August, we saw brochures dated to MARIO Cuomo and George Pataki. Soon these brochures will be historic items themselves! The NYT article goes on to recount the various efforts at the local level which are underway focusing on Sackets Harbor. For me, it was nice to see a picture of Connie Barone, the site manager. We have communicated by phone and email for years but somehow one of us was always unable to attend the conference or meeting the other was attending. Our hope was to put together a multi-day program across the northern tier perhaps from Oswego to Plattsburgh that would be available to teachers for professional development credit and to history lovers because they love history. There are some things going on worthy of notice. Tom Chambers of Niagara University is helping to organize the Conference on New York State History, and has been asked by the Program Committee to recruit presentations and panels of the War of 1812, its impact and significance, and how the war has been remembered. The annual conference will be held at Niagara University, in Niagara Falls, NY, June 14-16, 2012. Because of the conference’s location near some of most important campaigns during the War of 1812, and the war’s bicentennial, they are seeking 1812-themed papers and panels to develop a thematic strand to the conference. More information can be found online. Proposals may be submitted as directed on the CFP webpage, or sent directly to Tom at chambers@niagara.edu. The Association for the Study of Connecticut History, publisher of the journal Connecticut History, and the History Department of Connecticut College are sponsoring a one-day conference on Connecticut &amp- New England in the War of 1812, on Saturday, November 3rd, 2012. The meeting to be held at Connecticut College in New London, CT will feature both concurrent and plenary sessions with speakers from diverse backgrounds discussing a wide variety of topics that focus on the causes, impact, and consequences of the War of 1812 in Connecticut in particular or New England in general. The War of 1812 had a vital influence on the society, the economy, and the politics of Connecticut and New England. Although researchers may focus on individual events or people, studies of the wider economic, political, social, and cultural impact are encouraged. This conference will bring together people with different backgrounds and expertise to explore how the War of 1812 transformed the political and economic landscape of Connecticut and New England. Historical society and museum personnel, graduate students, independent scholars, teachers, and members of the academy are all invited to make presentations. For consideration, please submit a paper title, abstract, and a short c.v. Application deadline is June 15, 2012. Proposals should be sent to conference co-chairs: Nancy H. Steenburg, 493 Pequot Avenue, Mystic, CT 06355 or e-mailed (in MSWord format) to nancy.steenburg@uconn.edu, telephone (860) 405-9191, or Guocun Yang, Manchester Community College, gyang@mcc.commnet.edu, telephone 860 512-2782. Anyone want to comment on the chances of New York getting its history act together in time for the Erie Canal Bicentennial? 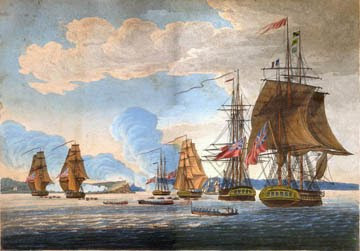 Illustration: War of 1812 attack on Oswego from the Paul Lear collection. As a Social Studies teacher I am disgusted by New York State’s utter lack of support for the War of 1812 Bicentennial. How are we going to teach kids to value history when our state chooses to ignore it? One of the most important reasons for remembering the War of 1812 is to remind ourselves that the only country to invade this country was England. This was done after they were kicked out. Our good, dear, dear friends the English can also be thanked for creating almost every single messed up country in the world today that we feel obliged to fix.